Coffee. Ahhh, coffee. People who love coffee really love coffee. I count myself among them. There's just something about the aroma, the feel of the warm cup in your hand, the deep and dark taste of it, that's so satisfying. In many ways our culture is built around coffee shops. "Want to get coffee?" is a common way of getting together, whether it's getting to know a new friend or catching up with an old one. 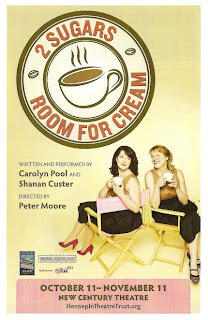 The two-woman show 2 Sugars, Room for Cream explores this idea in a series of short skits. It began as a Fringe Fest show a few years ago and has been expanded into a full-length show, currently running at the New Century Theatre (set up with cabaret tables for an informal coffee shop feel). It's funny, silly, poignant, and with such a wide range of stories that everyone is sure to find something to relate too. 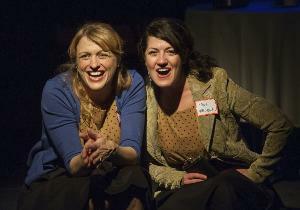 The two women in question are Carolyn Pool and Shanan Custer, who co-wrote and co-star in the show (with direction by Peter Moore). Shanan was the hilarious host of this year's Ivey Awards, but the last time I saw Carolyn it was in a much darker show - the twisted family drama August: Osage County. Nevertheless, the two are quite charismatic and funny together, with a great chemistry whether they're playing sisters, friends who haven't seen each other in twenty years, or people who have just met. The show opens and closes with one of the two scenarios that are visited multiple times - two sisters at their Uncle Jimmy's funeral drinking bad church basement coffee. They discuss their family and their lives, as the celebration moves to one of the sisters' homes and the coffee makes way for 2 Gingers whiskey, and the next morning, more coffee is needed. The other scenario with multiple scenes is a high school reunion, where two women meet, with one of them clearly remembering their relationship while the other does not. Again, coffee turns into drinking in the car and flirting with former classmates, which turns into hanging out at an all-night Denny's. Other skits include two new friends discussing how Twilight is damaging to young women (thank you! ), a frazzled new mom crying about her baby's tiny head, a period piece set in the '40s, a college professor introducing her class, bosses and their assistants (separately) on a coffee break at work, and a woman recording a touching video for her unborn daughter about how she's going to raise her to be confident and proud of herself. Carolyn and Shanan also sing a few songs for us in 1940s girl group style (original lyrics written by Shanan and Peter Moore, with music by Drew Jansen). 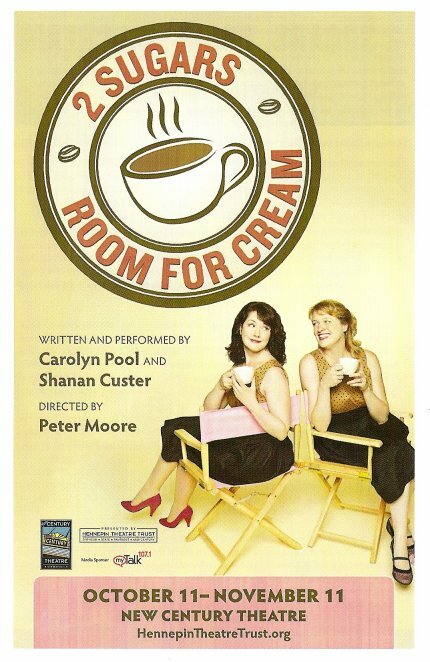 2 Sugars, Room for Cream is a thoroughly entertaining evening featuring two talented writers and performers. Together they create dozens of different characters, just by changing their sweater and shoes (some of them quite fabulous) over basic black dresses. Grab a cup of coffee and a friend or two, and head downtown to the New Century Theatre between now and November 11 (tip: half-price ticket deal on Goldstar.com). It's quite delightful (and it was the perfect antidote do the deliciously creepy Turn of the Screw I saw previously that day).